The results are in. 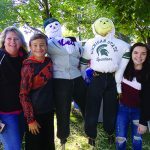 Rockford’s Make It “N” Take It Scarecrows was the most successful in the history of the event which was started by Denise Bradley and her family 21 years ago and is still privately run by the Bradleys. Rockford can claim to be the home of THE LARGEST SCARECROW BUILDING EVENT COUNTRY! 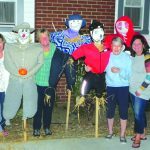 In addition to the annual scarecrow event, for the first time this year, pumpkins were offered for any donation as an additional fund raiser. The offer of the pumpkins was made by Paul Krupp of Krupp Farms last spring. He offered to plant 1000 pumpkin plants and that he would donate as many pumpkins as we would need to us for this purpose. After Paul’s tragic death, his wife Nancy called to say that she wanted to follow through on the pumpkin offer because Paul had told her of his plans and that was what he wanted. 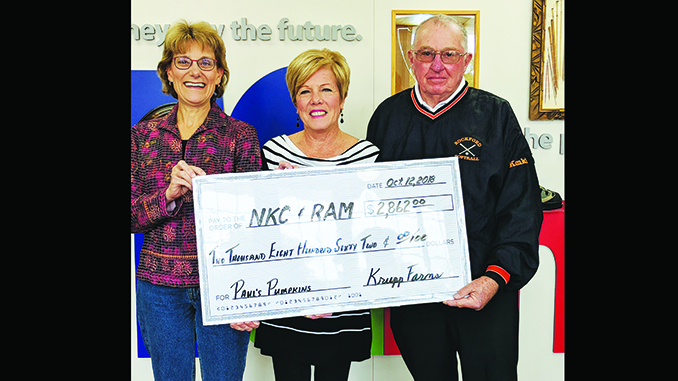 In a brief ceremony at the Rockford Area Museum on Friday, October 12, Claire Guisfredi from North Kent Connect (NKC) and Terry Konkle representing the Rockford Area Historical Society and Museum (RAM), accepted checks from Denise Bradley and Nancy Krupp. The total proceeds from the two events was $13, 862 that will be divided evenly between the two local non-profit organizations. Over 200 including individuals and representatives from local businesses, a church, boy and girl scout troops, the Lions Club and the LEO’s, Rockford Rotary, and 2 Rockford Krush girls softball teams who helped on site at the event, and others who helped with preparation of supplies throughout the year. 1 SCARECROW EVERY 47 SECONDS for 9 hours. All time single year donation record of $11,000 raised by Denise Bradley and her family who started this event 21 years ago. That money is being shared by North Kent Connect and the RAM. 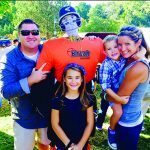 That brings the Bradley family’s total donation to our community from scarecrows over the years to……. WELL OVER $95,000! plus…an additional $2,862 was raised this year from the pumpkins that were given for ANY DONATION. Donations ran from $20 for a pumpkin to 42 cents from one young boy who was thrilled that his handful of change would allow him to pick ANY pumpkin he wanted. He was urged to pick a big one which brought an even bigger smile to his face. A few were given for no donation to young couples with toddlers but apparently no money in the budget for a pumpkin. As Denise Bradley always points out, this event is all about the children and the families. The Bradley family’s hard work and their generosity as well as that of Nancy Krupp and the support from our great community, made this year’s success possible. Anyone interested in helping with preparation for next year’s event is urged to call Al Pratt at 616 485-4144. Once you experience being involved in this event, you will want to stay involved.